While listening to the local public radio station WFPL recently, I heard a short audio segment called A Moment of Science. The show is a production of Indiana public media which is a producer and distributor of created content by Indiana University's WFIU public radio and WTIU public television. An archive of shows going back to 2003 are available for listening and reading on their web site. 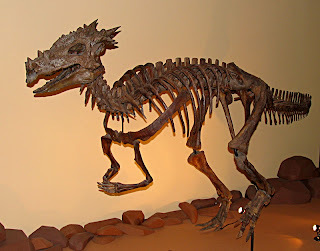 Picture is of a Dracorex hogwartsia on display at The Children's Museum of Indianapolis. This dinosaur is discussed in the podcast (see link further down) about naming new dinosaur species. It is now thought to be a juvenile Pachycephalosaurus. Dinosaur photo by Michael Popp.